ninja kitten: Crafting is hard. Let's go shopping! I'm not ready to take up sewing. But I may be ready to take up that gateway drug, fabric buying. My bed is from IKEA (ok, my apartment contents are from IKEA -- ooh, and not to digress or anything, but the new catalog came today!!!) I got one that's padded all the way around, because, let's face it, I'm a klutz, and I bruise more easily than a ripe peach. It has this delightful green fabric cover, which I love, but it's 7 years old, and my bedroom gets a ton of sun, and, well.... it's faded. It's getting to be a pea soup green instead of a grassy spring green. I've seen all those home makeover shows, and I know that all I need to refresh this piece of furniture is some cloth, an iron and a staple gun. That is easy! I know how to staple! So, Jenn, when do you want to hit some fabric stores? Ooh, if you do redo your bed frame, I would love to see pictures of it on the blog. I haven't been gutsy enough to try this yet. Heh. I think I don't talk to you on the phone because I have a hard time hearing you when you walk through your wind tunnels and then I feel rude saying, "WHAT DID YOU SAY?!" eighteen hundred times. Also, I think I send out angry vibes on the phone. Anyway, yes to shopping. 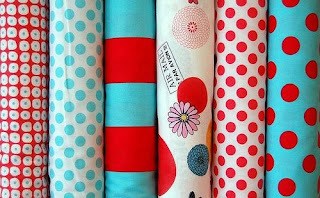 Do you want to hit cheap-o Jo-Ann, expensive but gorgeous Spool, or somewhere on fabric row?